The ZRC Store is Open! ZRC Tees: quality printing in 3 colors on American Apparel shirts. Comes with free ZRC sticker. Zombie Survival Kit: Comes complete with a copy of Max Brook’s Zombie Survival Guide, a REAL machete, and a non-functional firearm, all contained in a glass case illuminated from the inside by blue LED lights (not shown). 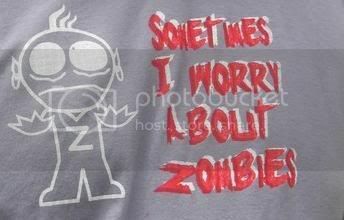 We here at ZNN found some fun zombie shirts on SplitReason.com, one of which we had thought was sold out but we are glad to now find it is still available considering we are now in the holiday season. See Happy Zombie Jesus Day tee below. Are Zombies the New Bunnies? I know the banner might not seem like it but Tina Seamonster's shop actually sells a lot of fun zombie stuff, both for the holidays (Halloween AND Christmas) and for just everyday. 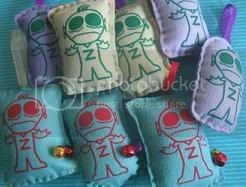 In addition to personally lettered or screen-printed shirts that proudly proclaim " Sometimes I Worry About Zombies," the I Like Seamonsters Shop also features holiday ornaments that warn of the impending undead plague and Halloween goodiebags filled with kooky items featuring, of course, seamonsters and Tina's very own zombie character, Mr. Z. Check out some pics below of some of the items that Tina makes and then go to her site and buy them. This is seriously some of the cutest zombie stuff ever, which only serves to prove Tina's quote, "Zombies are the new bunnies." 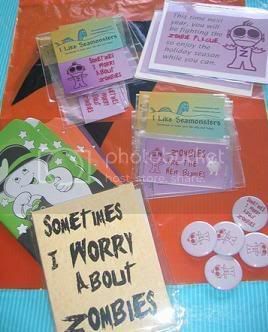 Support independent Art and DIY creations, especially those of the zombie and monster variety, by visiting Tina Seamonster's Shop. The Dead Walk…and Run…For Office. 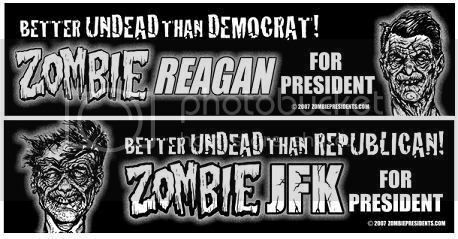 “I would certainly prefer an undead Kennedy to a living Republican in 2008,” Washington political strategist, Peter Loge, said, adding that "if worse comes to worst, I’ll vote for the zombie.” In that vein, Zombie Presidents has released a line of t-shirts, bumper stickers and other cool gear supporting the candidacies of undead presidents from our nation's past over the existing options for presidential hopefuls. Whether you think of bumper stickers, t-shirts and babydolls claiming to support campaigning corpses as social satire on the quality of candidates available to today's voting public OR you see them as just a great opportunity to portray well known guardians of the executive as putrified corpses, most zombie fans would have to agree that the concept is fun and the art used by Zombie Presidents is pretty awesome (see below). In addition to offering great products though, Zombie Presidents has also begun a photo contest that will award several prizes each month. The contest, titled Dead Men Running, will involve Zombie Presidents selecting its favorites from user submited images of Zombie Presidents shirts being worn at political campaign events and in the proximity of campaigning hopefuls. To learn more about this contest, see the official Dead Men Running page on the Zombie Presidents site. Also, if you are interested in purchasing Zombie Presidents gear, go directly to the Zombie Presidents page on WikedCoolStuff.com.